Thanks for bringing your kids this week to study the lesson from The Gospel Project® for Kids. This week’s Bible story is found in John 21:1-19. Ask kids to write or draw about a time that they needed to forgive a friend f on a sheet of paper. Guide them to fold the paper into an airplane and throw it as far away as they can. Explain that forgiving someone is like writing what he did on an airplane and never worrying about it again. Review John 21:1-19. When Jesus was arrested, His closest friends ran away. Jesus showed them that He had forgiven them, He still loved them, and He wanted them to follow Him. Sometimes we make mistakes, but that doesn’t mean that God no longer wants to use us in His plan! Jesus is a Lord who forgives us and makes things right again. 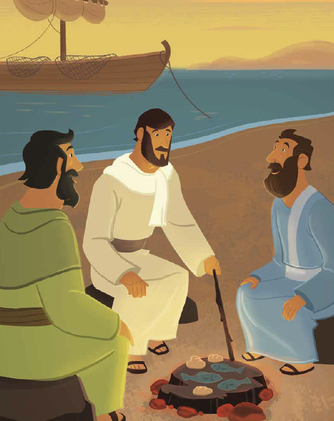 What did Jesus teach the disciples at breakfast?